Posted by Tantumblogo in abdication of duty, catachesis, disaster, Ecumenism, error, foolishness, Holy suffering, horror, persecution, scandals, secularism, self-serving, sickness, Society, unadulterated evil. Before I begin, the photo below is extremely disturbing. This photo is not suitable for children at all, nor those with sensitive consciences. I found it extremely disturbing. I have blogged about the ongoing and worsening plight of Christians in the Mideast many times. It is an unbearable fact that our government has been backing forces in the Mideast which have been, and continue to, engage in a nightmarish persecution of Christians. The Obama administration, no stranger to persecuting Christians, drove Mubarak out of Egypt and helped usher the radical Muslim Brotherhood into power. Attacks against Egyptian Christians have escalated terribly since these radical islamists came into power. In Iraq, the idiotic US war to try to install a liberal democracy in a place where none has ever existed, amongst the most illiberal people in the world, instead engendered a huge increase in radicalism islamism and the brutal persecution of the ancient Christian (specifically, Catholic) minority. 3/4 or more of Iraqi Christians had to flee the onslaught of violence they were subjected to as a result. And in Syria, home to the oldest Christian population in the world, Christians are being told by the so-called “Free Syrian Army,” really nothing but a puppet of Saudi wahhabist terrorists and the increasingly radical Turkish regime, that they may either convert, leave, or die. Hundreds of thousands of Christians have already driven from Iraq, are now being subjected to new tortures, while Syria’s 2.5 million Christians are fleeing to Lebanon in droves. They will soon run out of places to run to, at least in the Mideast, and the great islamist purging of Christians -aided and abetted by our government – will be complete. I made the photo as small as I could. You can click on it to make it bigger if you are so inclined. This little girl was obviously raped horrifically before being brutally murdered. I have studied the photo, as unpleasant as that was, and I believe it to be genuine. Her torturers tried to cut off her left breast, but must have given up, for some reason. There have been numerous reports from France, Sweden, Denmark, and other “Christian” countries, of young girls about this age being repeatedly gang-raped by groups of muslim men and boys. Sometimes over twenty men take part in these attacks, and the physical damage alone can be beyond mention, but I’ll say one word: colostomy. All for failing to wear a burqa or hijab – in a Christian country! Or at least a formerly Christian one! If you don’t believe me, click here. We must pray, pray, pray for these suffering Christians. And we must lobby our government to stop giving aid and comfort to those who would murder others simply for being of another faith. Not that it will do much good with our current muslim-in-chief, we still must stand for what is right and defend the many Catholics and other Christians suffering at the hands of these barbarians. And we must steel ourselves for a future where this kind of thing could be occurring in our country (I know, it already does, but thankfully rarely as of yet) on a near daily basis. Europe is likely to see more and more of the above as it becomes increasingly islamized. And yet, we have Catholics, with very high authority in the Church, whose highest priority with regard to islam is to credentialize it via ecumenism. Lord, have mercy on that girl, and on us. 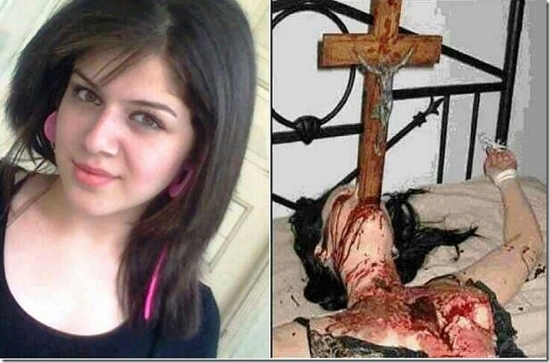 UPDATE: So, I am told the photo is a fake, that the gory picture on the right comes from some demented horror movie. Apparently, either someone decided to just engage in a scam, or some pro-Syrian government partisans got a bit carried away and used a fake image to promote their cause. I’m certain images rather like the above have occurred in Syria. But this one is, so say the debunking sites, fake. Mea culpa, mea culpa, mea maxima culpa. Absolutely demonic! Saint Michael the Archangel, defend us in battle. Be our protection against the wickedness and snares of the devil. May God rebuke him, we humbly pray; and do Thou, O Prince of the Heavenly Host – by the Divine Power of God – cast into hell, satan and all the evil spirits, who roam throughout the world seeking the ruin of souls. + In nomine Patris et Filii et Spiritus Sancti, Amen. Dear God! As horrifying as this picture is it needs to be seen by as many people as possible. Thank you for this post. It needs to be on Drudge and Jihad Watch as well. What is it going to take for people to wake the hell up!